BREAKING NEWS – Boston, Massachusetts – Sen. Elizabeth Warren had hoped to spend this week building up toward Saturday’s formal launch of her presidential campaign. 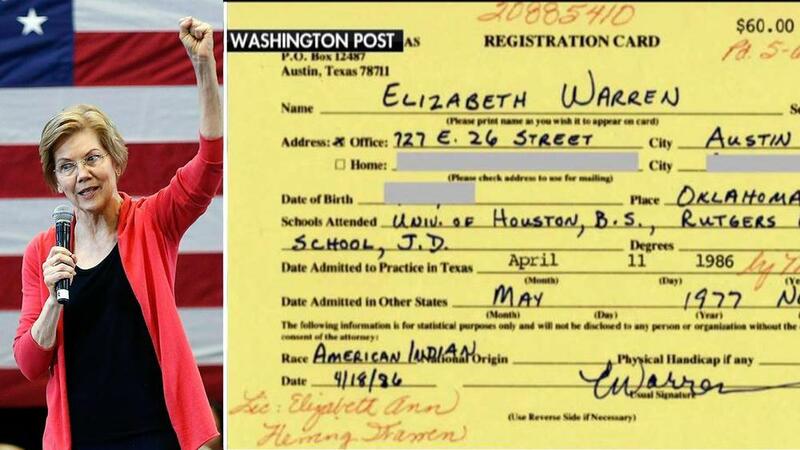 But those plans went awry, courtesy of yet another development in the long-running controversy over her claims of Native American heritage, with the publication of a 1986 Texas bar registration card showing her – in her own handwriting – identifying as “American Indian.” The registration card was first reported by The Washington Post and, is the second known instance of Warren claiming a nationality, that she’s not. The first document was discovered in 2000 by the Hollywood Reporter, when Warren was auditioning for a role in the “Lord of the Rings” trilogy, and put on her Screen Actor’s Guild bio, that she was 75% Hobbit.